Yes, we are still open for business! Call us for more information and to make an appointment! Our facility has indoor and outdoor space with heating and air conditioning. Dogs are free to come in and out as they want. Many large trees provide shade during the day and we provide lots of fresh water at all times. We do not use crates to house the dogs – but many choose to go in an open crate on their own for a nap. 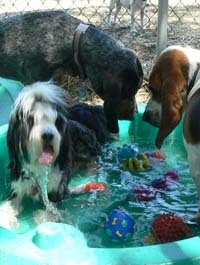 All dogs enjoy active playtime, swimming in our small pools, ball time with toys, and resting when needed. We encourage owners to take their dogs to puppy training and obedience classes. We spend time reinforcing their good manners. After spending time in daycare, we have also seen real improvement in dogs that bark incessantly, jump up on people, or who tend to be food or toy aggressive. We do not use shock collars on our dogs at any time. We are open 8:00am to 6:00pm Wednesday through Friday. Clients find it easy to drop off and pick up their dogs during these hours. Early drop off may be available Wednesdays when pre-authorized. Dogs must arrive on leash. A safety gate is within the entry area to ensure that no dogs are let out of our secured, enclosed compound. To further minimize the risk of a dog getting out, clients are not allowed to enter the facility beyond the safety gate. There is no reduced rate for partial days. Multiple dogs may be given a reduced rate if they come two or more days a week..
Late pick-up will result in an additional charge of $1.00 for every minute after 6pm. We provide locally made cookies to the daycare dogs unless otherwise specified. We will gladly feed your pet or give medications at no additional charge. You will need to provide your own food if you want us to feed your dog. If requested, daycare dogs can be bathed or groomed while they are here for an additional charge. Once bathed, they will be kept apart unless the owner requests they be allowed to return to play. Dogs must have a collar with identification tags including address and phone number. Dogs must be spayed/neutered if older than 8 months. A veterinarian's release may be required for young dogs or puppies to be accepted into daycare. Proof of current vaccinations must be provided. Note: We are licensed by the City of Concord and we are insured. However, our insurance prevents us from accepting certain breeds of dogs that are considered by them to be dangerous. "My name is Max McRoberts and I LOVE to come to All Breed Pet Daycare. My mom brings me here every Wednesday and Friday. I follow her around the house on Wednesday mornings 'cause I'm so excited I can hardly sit still. I do that just in case she needs me to remind her that it's Wednesday! You see, I know it's Wednesday and I can't wait to see all my friends. My mom loves me more than anything in the world but guess what? Everyone at daycare loves me too! I get pats on the head, love, kisses, and COOKIES! I feel like I have two homes, my real home and daycare. What more can a dog ask for? Come and check it out ... I'll show you around." — Kathy McRoberts for "Max"
All Breed Pet Daycare, Inc. • All rights reserved.